O yeah, we can call it a "clone megamix"!! Maybe Gradiente and TecToy shared plastic molds to cut costs? Tokumaro is correct about the button's functions. I saw some blog posts teaching how to swap the A and B buttons, so they become a little more like the real thing. Some people even say that it's even better than the real thing because it has no jailbars. I think the guy is looking at it with "pink glasses", since it has jailbars, and very noticeable!! The only advantages is that it can run bootleg games without moding, and didn't need transcodification to show the image in colors on Brazil back in the day. Maybe the cartridge connector was better, but I have some doubts about it. I recently have fixed one of these on this thread and looks like Zepper is trying to fix one here too. I really hope he succeeded!! It was told that Gradiente had an contract with Atari, and sold the old VCS here with the brand Polyvox. They were intending to release the 7800 too, but since it has not a stunning succes as the NES, they decided to use the already made molds and clone a NES instead. I also remember calling the CCE controllers the "Batman controllers". Sometime later the console was shipped with a Batman cartridge with it. AFAIK all these "heavyweight" manufacturers release their clones because of the market reserve politics, that basically forbid importings and such. Haha I bet if you threw the controller like a batarang it would come back to you! Still broken. The guy doesn't seem to be good at it. I sent to him the schematics, including the board pics without chips. The Famicom was only ever protected by patent law. The Famicom predates mask protections. The NES's CIC was additionally protected by copyright law. Random bits (logo, shape) are protected by trademark and/or trade dress law. Individual games are protected by copyright law. There's nothing about a bare famiclone that should infringe, in any way. Now, if it's one of those ones that come with N games built in, sure, the games infringe copyright. Did Ricoh take advantage of the fact that mask protections did not exist prior to 1984 to effectively steal the 6502? I prefer to think that the guy may not be used to work with such old tech stuff and is having some dificulties. I hope the guy succed!! He probably will learn his way through the schematics. Well... I'll do a related question. Is this cartridge "illegal"? 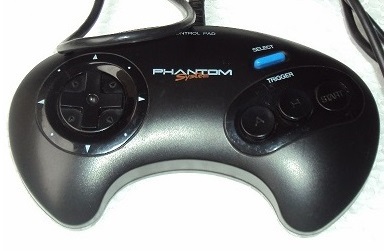 It's a Phantom System cartridge. Yup, a few others remove copyright notices, like Ghostbusters II - they removed the "activision" word from the credits. Other carts are entirely fine with no mods. I would say yes. The only protected part was the decimal mode, which was covered by a patent; they disabled it by cutting some conductors in the die, effectively sidestepping any legal trouble. The old Brazilian's law protected bootlegs!! I also would like to know if they're completelly illegal, given the older scenario. NintendoAge has some scans of brazilian bootlegs. They sure were the most affordable things back in the day. I also had a fight with one of these bootlegs when I tried to do my translated Legend of Zelda repro. I ended giving up of the bootleg and got a Famicom original instead. I still don't understand why Commodore didn't sue the hell out of Ricoh and Nintendo, especially considering that the NES was released in the US in 1985. As soon as mask protections became a thing, why didn't they immediately apply that to all their chip technologies and start demanding royalties. why didn't they immediately apply that to all their chip technologies and start demanding royalties. Can you enforce laws retroactively like that? I think I found the answer in the details of the law. From what I can make out, the law was only applicable to mask work that was first commercially exploited on or after July 1, 1983. Anything prior was potentially still up for grabs. It's really difficult to believe that Nintendo's entire empire originated off a piece of stolen technology. Didn't a similar thing also happened to Hollywood? From what I can make out, the law was only applicable to mask work that was first commercially exploited on or after July 1, 1983. According to Wikipedia, the Famicom was released on July 15, 1983... Maybe what they considered commercialization in this case was Ricoh selling the chips to Nintendo then? The 6502 was brand new in 1975, though. Oh, so that's the date for the original work being copied? So, after July 1st, 1983 I could still deliberately clone and sell chips made prior to that?